A landslide within the Vaiont Dam in northern Italy displaced a massive volume of water from the dam that flooded the valley below. 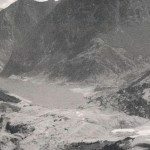 On October 9, 1963, between 10 and 11 P.M., a massive wave of water crashed over the top of the Vaiont Dam destroying everything in its path and killing 2,600 people. At a speed of 70 mph a massive slide of 350 million cubic yards of rock and ruble from one mountain had collapsed into the dam, displacing huge volumes of water that, like a tsunami, then descended into the valley below. It was the worst disaster of this kind in history and was caused by inadequate geological investigations prior to construction. More than once in modern society events serve as reminders of what we know but fail to put into action; namely, that those who choose to forget the past are doomed to relive it. The Vaiont Dam failure is one more example where knowledge of earlier cases like the St. Francis and Teton dam failures could have prevented failure at Vaiont. The flaws in all three of these dam failures were the same—the absence of adequate geological assessments before work on the dams began. Even as construction went ahead at Vaiont there were signs of trouble in the steep mountainsides on either side of the Piave River valley, the site of the dam. Instead of delaying construction until thorough geological studies were completed, engineers decided to use a trial and error method, measuring the rates of rock movements on both sides of the valley in relation to water levels. They finally arrived at what they considered a stable condition and went ahead with the project. The Piave River flows through limestone mountains in the Italian Alps, about sixty miles north of Venice, near the towns of Longarone and Castello Lavazzo. The purpose of the dam was to provide hydroelectricity for Milan and other big industrial cities of the north. The heights of the surrounding mountainous ranged from 7,200 feet to 8,200 feet. The valley floor was steep on both sides and so a very high dam was necessary. It had to be almost nine hundred feet above the valley floor, the second highest in the world. Limestone rock is formed in layers and if the cohesion of the layers is weakened by water, or by changes in pressure from neighboring rocks, landslides are possible. Planners knew this and were also aware that landslides had taken place in the past in the very spot where the dam was being built. Construction was completed by 1960. As the finished structure began to fill with water, and sides of the dam were being monitored for any slide movements, engineers noticed that the amount of water and rate of filling affected the stability of rocks and soils on both sides of the valley. People began to notice large cracks in the earth near the top of one of the mountains bordering the dam. The thousands of villagers who lived in the valley below were far from being at ease with the nine hundred-foot-high edifice looming above them. For three years following completion in 1960 there was a significant element of fear pervading the homes and villages beneath the dam. Some of the technicians who were involved in maintenance work on the project also expressed continuing concern over the danger from landslides. They pointed out that the mountainsides were dry and inclined to crumble because there was no vegetation to hold the soil in place. Their fear was that a heavy storm or some large rocks hitting the reservoir could cause water to cascade over the top of the dam into the valley. From such a height even a small flow of water could be disastrous. Concerns mounted as slippage along the face of the mountains became more and more evident. The technicians sent a report on this to the relevant government department in the country’s capital city, Rome. While waiting for a response from Rome there was a sudden change in the weather. After weeks of dry, hot conditions there came heavy rain and high wind. By early October of 1963 the mountainsides changed dramatically as they became saturated with water. The groundwater table in the area also rose, saturating the ground and decreasing its strength. Slow creep of the valley sides was noticed in September. By October 8, the day before the disaster, these movements reached an alarming rate of sixteen inches a day. The last measurements on the ninth indicated double that rate over some areas. Animals sensed the danger and began moving away. Engineers became alarmed and lowered the water level but even as they did so the reservoir level continued to rise because soil and rocks were entering the lake in increasing quantities. Thus the water in the dam was being displaced by the slow creep of an impending landslide. Late in the evening of October 9 a large block of rock, soil, and de- bris—a mile wide and more than a mile long, and about a thousand feet thick—roared down the mountainside into the reservoir displacing huge quantities of water. A gigantic three-hundred-foot wave was generated and this mass of water, like a tsunami, swept over the top of the dam and down into the valley. The dam remained in place but destruction in the valley was catastrophic. The water rushed down the valley like a solid wall hundreds of feet high, destroying everything in its path. Village after village and one home after another all disappeared leaving behind a mass of mud mixed with bodies and bits of building materials. Some people farther down the valley heard the sound of the approaching wave as if it were a tornado and managed to get out of its way in time. They knew at once what had happened. Longarone, the largest community, experienced the greatest amount of damage. A day later, onlookers compared the scene with the two-thousand-year-old ruins of Pompeii, the only other event they could recall that caused comparable devastation. That event happened more than two thousand years earlier. In Longarone, as in all the other places along the Piave Valley, records of local residents were lost because the official buildings were destroyed, so it took some time to assess the loss of life. Gradually, as survivors met, the full toll became clear. There were 2,600 dead. Even as the enormous scale of the tragedy was being grasped there was more terror. On October 15, there was another slide of rock into the reservoir. This time, authorities were fully prepared. An evacuation plan was in place and buses quickly carried people to safety. In the technical inquiry that followed, it was determined that the area was geologically unsuitable for a dam. In addition, the building work that took place further weakened the surrounding mountainside, thus making slips inevitable. Nine men were accused of gross negligence. Five years later, on the night before their trial, the leader of the nine took his life. The others received sentences ranging from fines to years in prison. One final outcome was that authorities launched a series of investigations into all dams in Italy’s alpine region.